This GUID needs to contain the value from within your azure subscription. So far so good. The problem (such as it is) is that for a whole host of reasons I’d rather define this key within the web.config rather than a separate configuration file, as this makes managing keys much easier. If I’m deploying straight to Azure, I’d like to define app settings in Azure so as to override this value for my live environment. Or, if I were using Octopus deploy, I’d like to be able to define a variable and have a different value per environment (Test/Staging/Live and so on). Using the ApplicationInsights.Config file for this makes life a lot more difficult than it needs to be. Now, I’ve looked at loads of suggestions as to how to overcome this issue – but none (other than the one I’m about to present here) worked for me. Your mileage might vary however. What I wanted was a simple way to write some code in order to read the iKey from my web.config, such that I could roll out my website and have the appropriate key updated for me. In order to do this I had to pull out my trusty copy of .NET Reflector and look at the code. I found a number of posts in the web that suggesting updating the value of TelemetryConfiguration.Active.InstrumentationKey, but regardless of where I set this it didn’t work. During my spelunking through the code I did find that it’s possible to override the value from the ApplicationInsights.Config file with an environment variable – that being APPINSIGHTS_INSTRUMENTATIONKEY. If this value is defined on the machine you release on then fine, you’re in business. I can see that this is a decent option if you own the hardware that this is running on as someone from IT can login, set the value, and be done with it. But who owns servers these days? I wanted something that was effectively “zero-touch”, and environment variables are not exactly that – nor did I want to write a .ps script that would set this, so I headed out to find another option. So, it configures the telemetry channel (where the telemetry goes), then the initializers and so on. I had a thought – what if I were to add a new class into this initialization phase which would read the iKey from web.config, then I’d be able to plug this into the pipeline and I’d be sorted. Voila! I have my key used by AppInsights, and I can now setup replacement keys for staging/live in the appropriate tool (in my case Octopus). This was a bit harder than I’d expected but I got a solution in the end. I can now use this initializer to allow me to define the AppInsights key in a more convenient spot. I don’t have a code download for this – please feel free to cut & paste the code above into your project, and update the web.config file as required. I’m working with a WebApi that is passed the HttpRequestMessage class which is always available in the ASP.NET WebApi pipeline. However, when the documentation is exposed in Swashbuckle, I get a textbox that shows up where it expects me to enter a value for this parameter. I set about finding a way to instruct Seashbuckle to ignore this parameter, and finding there isn’t anything in the box I set about writing a filter that would do this for me. Today was One of those days™ where things just didn’t work well, or rather at all. I’ve been working on an ASP.NET WebAPI that was working fine against Auth0, but needed to update it to use OWIN. It took a while to update everything and get the appropriate packages installed, and then I went through the code and ripped out the old and replaced with the new. I’d written this code myself to call the Auth0 API as I couldn’t get the provided Auth0 code to work at all – the response I was getting back was always a null. The LoginRequest and LoginResponse objects simply mimicked the request and response data sent to and received from the Auth0 API that I was calling. When I called this I received a token back – but then the problems started. Whenever I called my API, all I got back was a 401 Unauthorized response. It took me a long time to sort this, I even went to the bother of creating an entirely new solution with two web apps included, one to “login” to Auth0 and get a token, the other being the API I wished to call, so that I could raise a support incident with Auth0. I had a feeling that it must still be something I was doing wrong as I’ve used Auth0 for a while and to be fair it had previously been working fine until I did this upgrade. Finally I had something to go on! I've worked a fair bit with JWT tokens over the last couple of years so happened to know that the issuer was one of the fields within the JWT, so then I knew that something was either not sending the right issuer, or when decoding the token on the API side the wrong issuer was being used. Now, just to be clear, I had made ZERO changes to my web.config between the old (non OWIN) version that worked, and this new version that didn't work. So I was suspicious to say the least. The auth0Domain value did not include the scheme or trailing slash, and this was being used by the Auth0 code as the issuer. With this knowledge I simply updated the web.config to https://redacted.com/ and sure enough my code started working again. Hopefully this helps someone else, it took me quite a while to solve! Being a geek I looked into this further and found that it was an issue with how Windows Live Writer authenticates (i.e. logs in) to Blogger. Google have disabled the mechanism that WLW was using, and so at this present moment (28th May 2015) you can't use WLW with a Blogger account. Pants. There is currently no workaround (for WLW that is) - you simply cannot use it. If you're on the Blogger platform you can use their tools to blog with (that's what I'm using here), or try out some other blog tools on the web. 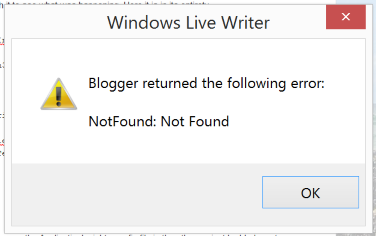 For now I'll limp along with the Blogger UI, it's OK - but nowhere near as easy to use as Windows Live Writer. Sadly it seems that Microsoft are no longer maintaining WLW, so you may be waiting a long while for a fix. If, like I was, you’re struggling to get anything out of Azure Application Insights, I hope to be of some help. I ran my app and imagine my dismay when nothing happened. I checked around in blog posts, looked at the official documentation, tried a bunch of things – but stubbornly the above lines of code simply didn’t want to work for me. Not a great deal going on there! 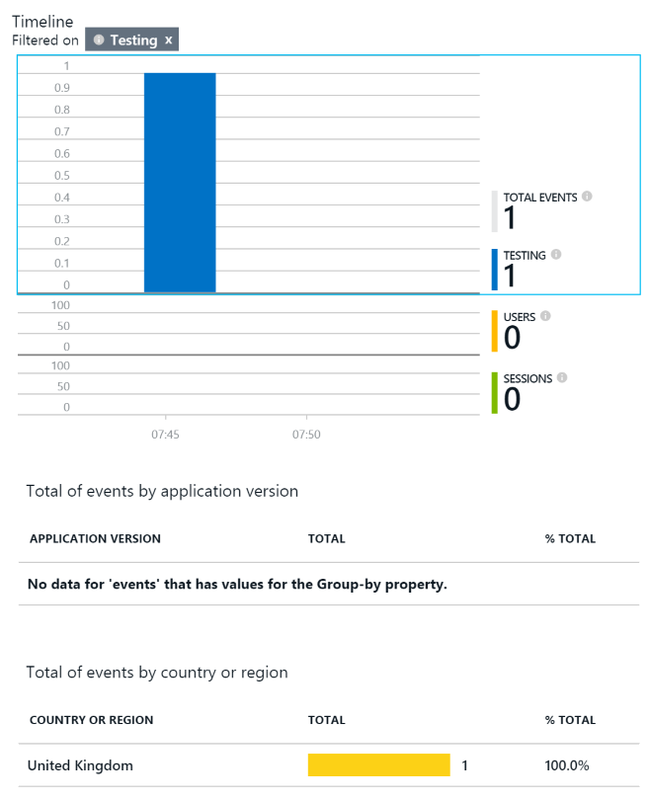 Having seen the ApplicationInsights.config file in the other project I added one to my console app too – well, I copied it from the web app to be fair. I ran the app and once again – nothing. At that point I decided it was time to do some debugging – but I couldn’t find symbols for Microsoft.ApplicationInsights.dll (and others from the App Insights stable), so I dragged out my trusty copy of Reflector and created some. If you didn’t already know, Reflector can generate missing PDB’s for you, it’s cooler than a penguins chilly bits and well worth the cost. Note: If not present, please add <InstrumentationKey>Your Key</InstrumentationKey> to the top of this file. Here the TelemetryModules section is quite clearly defining a bunch of plug-ins, the first exists (as it's in Microsoft.ApplicationInsights which I have referenced), the second and third do not and sure enough the second is the subject of the exception I received. Armed with this knowledge I did a hatchet job on the .config file and removed anything I didn't have referenced from Nuget or directly. I then ran the app again and to my dismay - still nothing happened. I was expecting to see an HTTP Post request flying over the wire to Azure, but instead there was nothing. Flush, aha, he saved every one of us! (Sorry for the abysmal pun, I couldn’t help myself). I did a bit more digging on the TelemetryClient and found the Flush() method which I have added into the code samples above, but didn't have in my code at the time. 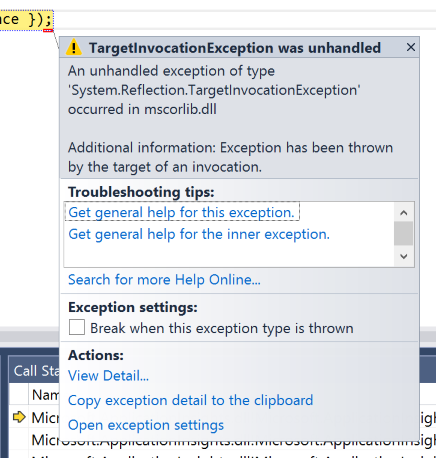 With this added I was delighted to see a message show up inside Visual Studio that alerted me to the fact that I had managed to send an event to Azure.. So far so good. I then logged into Azure and lo and behold, I got my event! OK, so “more” data is somewhat subjective, but it did tell me that my event came from the UK which is correct. I have no doubt that I could augment the data being collected from my application so that the amount of detail here would be better. And there you have it – one event in Azure, an hour or more messing around with it to understand what it’s doing, and I’ve got a load closer to working out why my web app wasn’t sending any telemetry (or rather, the custom telemetry I was expecting to send). I hope that helps someone else! Next time I’ll see what’s up with my web app. For some time now on my main development machine I’ve been having issues – Visual Studio has begun taking an extremely long time to load, and when running or debugging web apps these too have been taking too long to startup. It’s one of those issues where you put off fixing it for a while as it’s not too bad, but then it gets to the point where it’s really hampering the dev/test/debug cycle, so this morning I set about working out what it could be. I disabled the extensions I have loaded and that made little difference, so then went to ProcessMonitor to see if I could work out what was happening. In the case of Visual Studio, it would take around a minute to start a fresh copy. This was way too long. For websites, it was maybe 30 seconds or so – again, way too long. With process monitor running I created a new instance of Visual Studio, waited until it was done, and then paused event capture and went to have a look into the events. It wasn’t long before I noticed a *lot* of files being written to the C:\logs directory – on my machine I keep this for one of two file types, actual log files from my code, and log files from the assembly log viewer, FusLogVw.exe. Smoking gun in hand I had a quick look at the size of the Logs directory and it was up to 8GB! Oops. A small while later (after disabling FusLogVw.exe and deleting the files), I’m back to snappy performance with VS loading in about 4 seconds, and websites in a second or so. I’m in the middle of writing a Xamarin Forms app and today I needed to add in a contacts search page, and remembered that James Montemagno had created a plugin that exposes contacts in a platform neutral manner so I downloaded it and used it in my app. So far so good. Then I needed to hook up the search box, and as I’m using XAML (and if you’re not, you should give it a try as it’s way easier to create UI’s using it) I needed a way to bind to the search box to that I could respond to the TextChanged event. Another excellent package that you’ll want to use it the Xamarin.Behaviors package by Corrado – massive thanks to him for putting this together, it’s excellent! This hooks the TextChanged event of the search bar, calls the SearchTextChangedCommand on my view model, and passes through the value of the Text property of the search bar. Yay!. The problem I found was that my command was being passed a string, but it was the text before the ne character was entered, so say I pressed ‘X’ in an empty search bar, my code would be called with an empty string. Pressing ‘A’ next, my command would get ‘X’, and pressing ‘M” next, my code would get ‘XA’. I was always getting the data just prior to the new character – so I guess that the TextChanged event should be more clearly termed as the TextChanging event. Anyway, I needed to fix this – so looked at the actual event and it contains two properties, the current text and the new value. All I needed to do was get the new vale of the event arguments and I’d be away. Here I'm using my SearchBarTextChanged behavior to hook to the SearchTextChanged command, and sure enough now when I type in the search bar I get the desired effect. Excellent! In the view model I use James’ contacts plugin to select all contacts that have a mobile phone, and that have at least a forename or surname (my real code blew up on a colleagues iPhone as he has a contact with just a company name). I tuck this list away as the source, and then create a filtered collection from the source and the filter statement. The above code uses some Linq to select all contacts and group them by first character of their surname. I created a simple Matches(contact) function that checks that the contact has a mobile phone number and also that they have one of forename or surname. This is a bit ropey but does the trick. As the collection is an ObservableCollection, any changes are shown in the UI immediately. I’ve created a simple example project (the one shown above) that you can download. Hopefully this will help someone out. I’ve not tried this on Android or Windows Phone as yet, but as none of the code is in the platform specific library I can’t see any reason for it not to work on those platforms too. Hello, I'm Morgan Skinner and have been working with computers since the dawn of creation - well, 1980 on a ZX 80. After graduating with a 2:1 in Computer Science in 1989 my first job was as a programmer in a small company in Altrincham, Cheshire, where I travelled the world and had a superb 12.5 years, working my way up from Junior Software Engineer to Development Manager. In 2001 I left and went to Microsoft, where I spent nearly ten years in a team of remarkably talented individuals, working with customers on .NET. I left Microsoft in 2011 and formed my own company doing software architecture, design, coding, testing and debugging - basically everything up to the point a system goes live. I'm always interested in helping out if I have availability, so if you need assistance with .NET then please contact me.